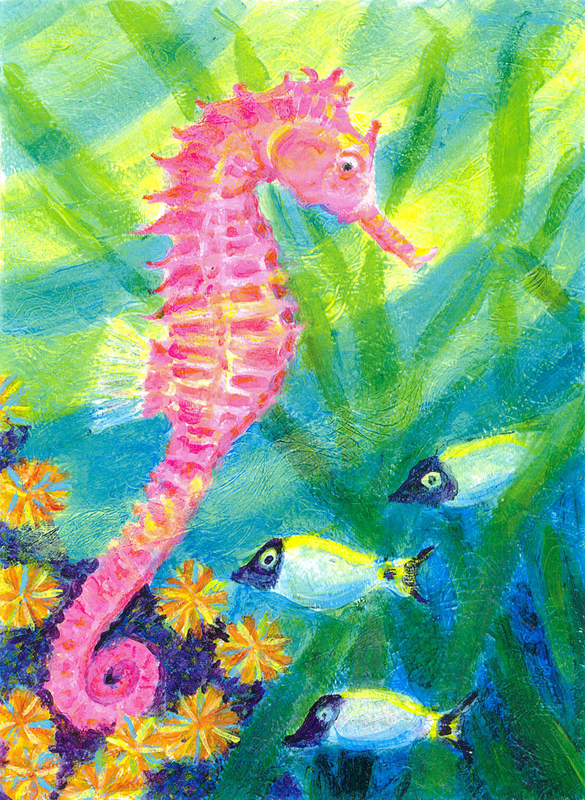 I have just completed Pink Seahorse for my Heni’s Happy Paintings Etsy shop. Early this week a woman contacted me through my shop. She liked the style of my other seahorse print listed there but instead of a seahorse family she wanted one pink seahorse. Seahorses are such interesting creatures. Years ago when my daughter was in elementary school I remember taking her to the Fernbank Museum of Natural History where there was an exhibit of seahorses in several tanks. They were so magical with their amazing colors and horse like shapes and the way they skirted through the water. I could have watched them for hours. I decided it would be fun to paint a new one and that it would be a nice addition to my sea life prints which have been popular sellers. I haven’t heard back from the woman yet, I hope she will like it. Regardless, it was fun to paint and I’m pleased. This is a new painting I made because my niece Julia requested an Octopus. 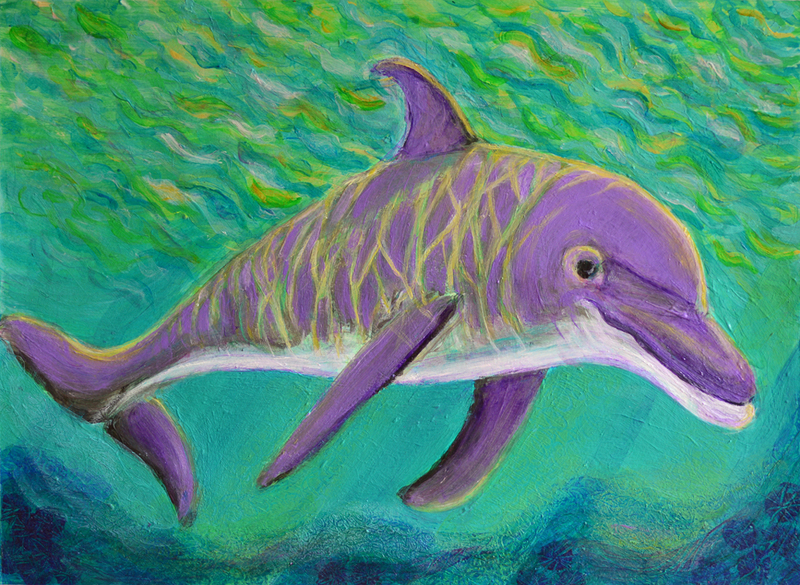 I had done three paintings of dolphins, one of which I thought Julia would like for Christmas since she had enjoyed swimming with them on our Hawaiian trip. When I showed them to her she said that she would rather have an octopus instead. I didn’t feel like painting an octopus as I think of them is being a bit creepy. I went shopping on Etsy and found a cute octopus necklace for her instead. 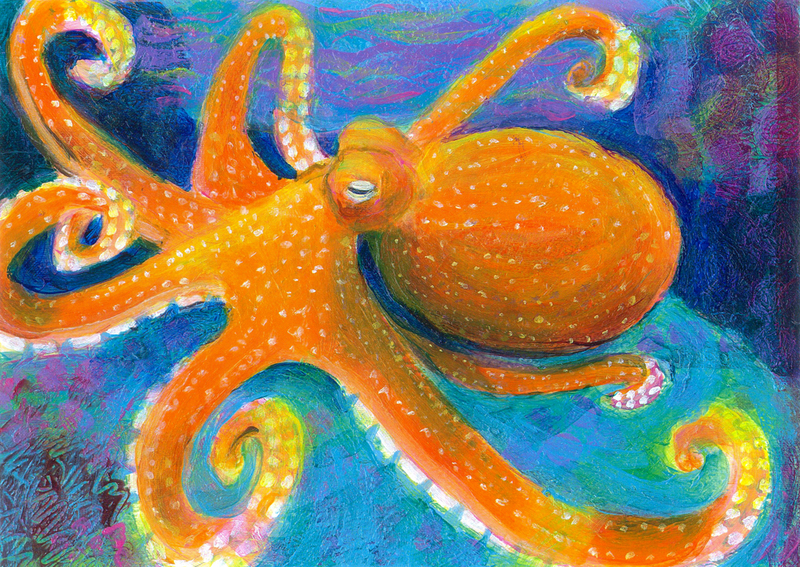 Once Julia had put the thought in my head I decided to go ahead and paint an octopus as I am wanting to add more kid friendly prints to my new shop . I also thought it would make for an interesting composition by creating different spaces with the unusual shape of an octopus and all of it’s legs. It was fun to paint and I’m fairly pleased with the result and now I am ahead for next Christmas! Purchase print here: Orange Octopus. Ever since I was lucky enough to spend two weeks on a fishing boat in the Caribbean and learned to snorkel, tropical fish have amazed me. It was magical to witness these vivid colored and various shaped fish gliding along as if choreographed in a backdrop of coral in light dappled aqua water. I painted Caribbean Dreaming a couple of winters ago during a cold spell to lift my spirits. 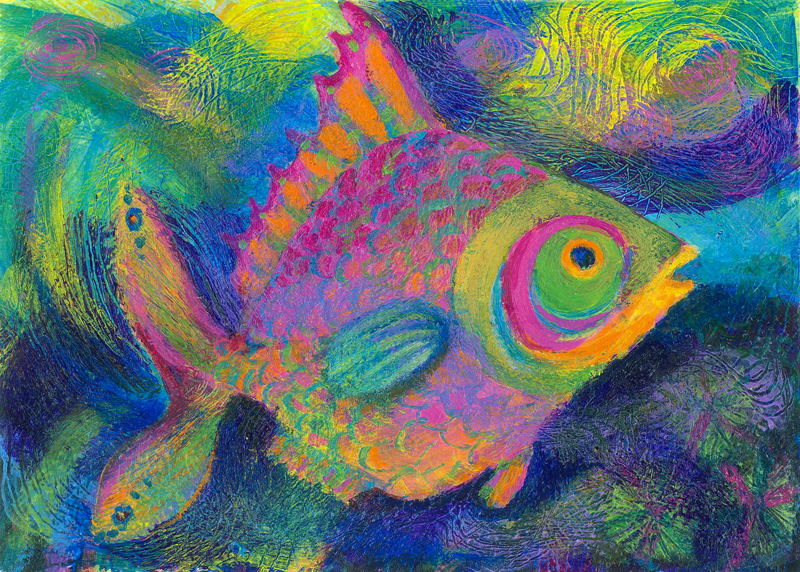 I find it freeing to paint fish because pretty much any thing goes, you can play by layering colors as the fish starts to appear and the background can also be just as colorful and layered. 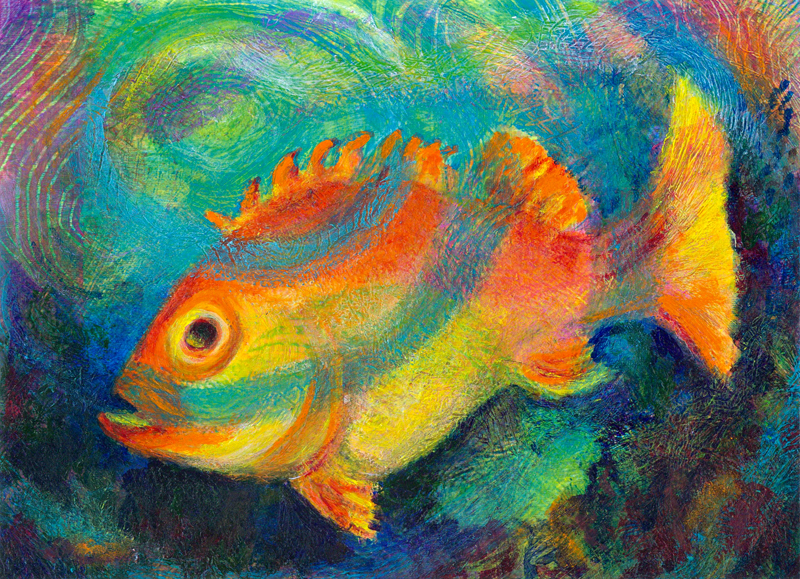 This year January has been unseasonably warm but cold weather is sure to come for a bit and I will definitely take time to paint a new fish.